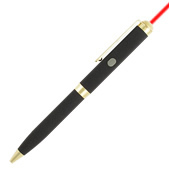 This sophisticated combination pen and laser pointer is the perfect solution for business presentations! 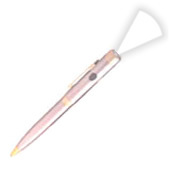 Always at hand, you'll be amazed at how convenient this pointer is. Easily highlight important information and take notes with the same tool. Constructed of a solid brass housing with black finish and gold trim, this laser pen makes for an excellent engraved promotional gift or corporate incentive.